have a field called Position which contains the cardinal direction of each point in relation to the polygon. Geoprocessing Results for any error messages. This is great! I need to join PLS data on tree species and landscape characteristics to the corner points and midpoints and of course the grid is not symmetrical. The directional reference is just what I needed to match up my points. If you wanted to expand this tool, could you add a midpoint option also with position reference (N,S,E,W)? Also optionally preserving the original polygon attributes would be very helpful too. Thank you again! This has really helped me! Hi Tammy, thanks for the comment and suggestion! That’s a really good idea. I’ve now added this capability. 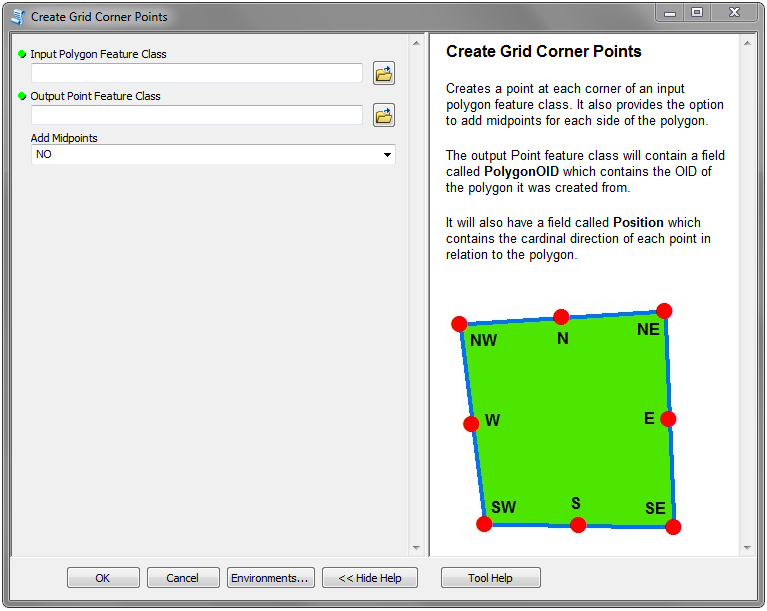 Also, you can use the PolygonOID field to join with the old polygon feature class to get the attributes. Hope it helps! Dude, thank you so much for the tool you make. I extractied polygons of map index to get the nw and se coordiantes using your tool with arcGIS 10.3. It helps me alot. Tools you have helping us a lot. How to make a shapefile(which is not grid aligned) to grid aligned?